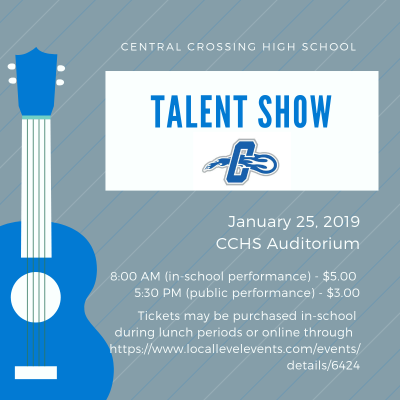 The Class of 2020 will be hosting the CCHS Annual Talent Show on January 25, 2019. There will be two performances: an in-school performance for students and staff during 1st and 2nd periods and an evening performance at 5:30 that is open to the public. Tickets may be purchased at CCHS in the cafeteria during lunch periods or here on LLE.